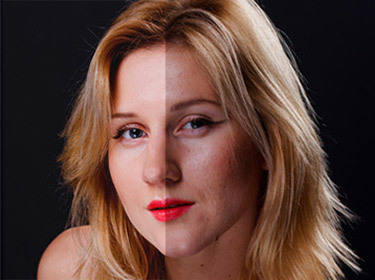 If you are a becoming photographer you have most probably faced the problem of how to make your portrait better and get rid of the unwanted blemished skin. And most importantly - not to exaggerate: we don't want to get too blurred or unnatural skin as the result. We want to see a person on the photo, not a doll. This article will cover several steps of how to work in Lightroom and Photoshop in order to get a beautiful portrait. Notice: If you don't have Lightroom you can skip the following two steps and go straight to Photoshop tips. The similar tools will be described in the next three steps. Let's open up our photo in the Lightroom program. You should remember that it's more preferably to have a photo saved in RAW format. This can be done in your digital camera settings. RAW format contains more information and therefore you can change settings without losing the quality of the image. Let's work with the color. If you don't like the brightness, shadows or highlights you can modify them in "Basic" settings. Try out and you will find your best solution. As you can see there are some undesirable pimples on the face and the skin is a bit rough. We would like to get rid of it to make the face look smoother and cleaner. Let's see what we can do in Lightroom with this. The program has a nice instrument called "Spot removal". Hot Key for it is "Q". Choose this tool and select a problematic blemished skin area. Click on it and then move to the place on face where it's smoother and mostly matches the skin texture. It will take some time but the result will be nice and you won't have to spend much time on it in Photoshop. The skin shouldn't be perfect. If there are still some blemishes don't worry. We will work on it later in Photoshop. Step 1. Photoshop. Frequency separation method. Let's save our photo in JPEG format and open it up in Photoshop. Firstly, we should create two duplicate layers of the source image. This method is called frequency separation method. It helps us to save the sharpness and details of the photo. Even if we apply later the healing brush tool the basic information will be preserved. With these layers smoothing and painting on your image becomes less destructive. It's like a thin outline of the photo that is placed over the source layer. We will do it by creating High Frequency layer and Low frequency layer. To do this you select your source layer (in our case it's called Background) and drag it to the icon down on the menu as shown on the picture below. Afterwards, we convert these two copy layers to Smart Objects. To do this you click on the right bottom of the mouse and choose "Convert to Smart Objects". We will work now with Copy 1 smart object. Go to Filter - Blur - Gaussian Blur. Apply "Gaussian Blur" to the smart object "copy 1". This is our Low frequency layer. Select the radius of around 15 pixels. But it's not so essential. Some lessons give the number of 10 pixels. But I in this photo I've decided to choose 15 pixels. With the "Copy 2" we do the same steps. But this time we choose High Pass instrument. Go to Filter - Other - High Pass. This is our High frequency layer. Choose a radius of around 10 pixels. Then we select Curves tool. Image - Adjustments - Curves. Or simply choose it in the bottom menu where your layers are saved. Let's lower the percent number of opacity down to make it look more natural. All these three layers (Copy 1, Copy 2 and Curves) we should put into a Group. Put the right icon "Create a new group". Or simply use the combination Ctrl+G. We do this for simplicity. To continue our work with the blemished skin we duplicate our Source layer for safer work. If something goes wrong we can delete this layer at any time and create a new one. Choose Spot Healing brush tool and change its settings as shown on the image below. I used to work with a round brush but thanks to one article on this issue I've learnt that it's much easier to work with an oval shape. I did it and now I can really recommend it to you. All the setting may slightly vary . Now we will work with the rest of our blemishes. Just click on the spot and it will automatically change it to the smoother skin. Unlike Lightroom you don't personally choose the smoother area of skin. The program does it automatically. If you don't like the result just cancel the action (Ctr+Z) and try again. The smaller the blemish the smaller brush you should use. The result will be much better. After working with our blemished skin we will paint on it. Why? Because the face can't be perfectly clean without any shadows or highlights. And it's normal. But we will help it. Just a bit. You can see that there are some too light or too dark places on the face. Let's help it. Brush tool will enable the skin to look smoother and cleaner. Don't forget to adjust some settings of your brush. Lower down the brush capacity to around 60% and flow - to 55%. It's done not to exaggerate with the effect. Create a new layer to paint on it. Again - you do it for your safety. You will be able to delete it at any time and create a new one. Pick out "Eyedropper tool". Choose the area on the face you would like to work with and click on mouse. The right color will be selected. And here we go. Every time we choose the color with the help or Eyedropper tool and paint out the areas. Imagine using a powder instead of a brush to apply on the face. Then we go to Filter - Blur - Gaussian Blur and choose the number of 35. But it depends on your photo. The number can vary. We go further with the brush and work with it. It's better to create new layers and work with the color separately. It facilitates the work and enables to control the process. But don't exaggerate! You can lower down the capacity of the layer to look it smoother. Some final touches with the exposure and curves. It depends on your taste what you prefer. I hope you learned something new today. Share your thoughts in the comments below!